Today, as promised by my mother, there was a special fortieth birthday party for me – complete with a rebound original 1890 Wisden as a special present. Normally I could not be given so expensive a present as this $500 Wisden, but my mother agreed to for this occasion since she says forty years is the midpoint of my life. The 1890 Wisden bought for my birthday. A pity that the image is blurred! 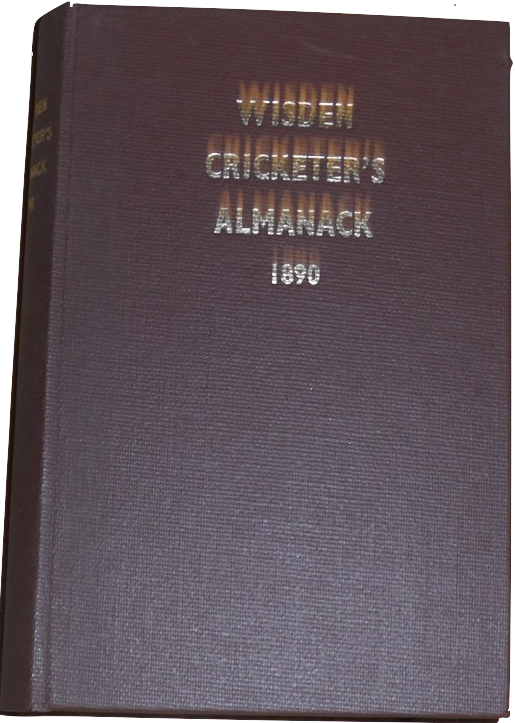 The 1890 Wisden is not only the oldest original Wisden I have ever received, but makes continuous my collection of peacetime Wisdens from 1881 to 1992. The 1889 season covered by it is notable for the debut of “the rhyme that lies”, a reference to Arthur Mold and the phrase “Mold bowled”, repetitive in the thirteen Wisdens from 1890 to 1902. Mold debuted to devastating effect in 1889 on a series of fiery or crumbled pitches, but he was considered by most neutral observers to be extremely lucky to bowl twelve seasons before being no-balled for throwing. Mold took over fifteen hundred first-class wickets and his speed and off-break made him unplayable when pitches crumbled or were sticky. It’s probable that the exceptional strength of English bowling in the middle 1890s – a strength rivalled only in the middle 1950s since – and his weakness with the bat helped Mold to get away with an unfair delivery for so long. The original 1904 Wisden I bought myself. It contains the full book inside – I couldn’t show the pictures as the fingers are not mine! Aside from the 1890 Wisden, I also received an original 1904 Wisden of exceptional quality and price. I did have a Willows 1904 Wisden, but receiving so good an original at such a price (it was discounted because of numerous blank pages at the rear which I find ridiculous). The birthday was highlighted by a remarkable abundance of good food, as my brother came from Monash for both lunch and dinner. The lunch was a familiar supermarket roast chicken with stuffing, but I ate it up enough that I did not realise there was a little more chicken in the bag. There was a remarkable amount of cake – one older mandarin and almond cake, one lime cake and one pear and chocolate moose cake which was bought for the birthday of myself and my brother. All three cakes were delicious, the mandarin and almond cake made to test a new cake tin especially so. We walked to the city after this, and I was bought a pair of very good sunglasses, after being laughed at for the sunglasses I had suggested earlier. Although I squint very badly in glary sunshine, I possess no experience buying sunglasses, but the pair I was given is certainly very good and fits me better than the pairs I was criticised for trying. I was by then quite tired, and after we went to Chemist Warehouse, we travelled home by tram. The last part of the birthday was another highlight. We went to a small French restaurant in Rathdowne Street that – despite walking or cycling down the street countless times since moving to our present address nineteen years ago – I had never so much as seen! We were the only people in the restaurant, and although the food was very expensive the duck and orange sauce I had were utterly delicious! I have seldom eaten such tender and sweet food in my forty years! During our time in the restaurant it was commented that I became nervous when others spoke consistently about topics not of interest to me – something highly perceptive because I know instinctively that it is very hard for me to listen to conversations on such topics! This was true even with subjects like the death of non-Mandarin Chinese dialects, or modern cricket, where I would have some hope of speaking with some knowledge. The restauranteur had had an unusual history, having lived in Singapore and England before moving to Melbourne. The last stage of the trip before my brother left to go home was a gelati at a place in Lygon Street opposite the main shopping centre where I have done most grocery shopping for many years. I forget the name but enjoyed the mango and strawberry gelati very much. All in all, this was a great fortieth birthday and I appreciate why we cannot have this every year. I also appreciate the problems I have had with my behaviour, which still do not go away despite my mother saying I am always improving.